TSA is Moving to Alexandria – Not St. Elizabeths? The August announcement that the Transportation Security Administration (TSA) is moving their headquarters from Pentagon City in Arlington to Alexandria left many people familiar with the Department of Homeland Security (DHS) asking the same question: what about the DHS headquarters consolidation project at St. Elizabeths in Washington? The St. Elizabeths campus is designed to be the new home of a unified, strengthened DHS. However, based on previous decisions the General Services Administration (GSA), DHS and Congress have made regarding the future of the St. Elizabeths site, TSA had no choice but to find a lease through GSA elsewhere. Shortly after the department was formed in 2003, the General Services Administration (GSA), the federal agency responsible for public buildings, and DHS jointly identified the naval station at the Nebraska Avenue Complex (NAC) as a temporary housing solution to at least have a place where the secretary and immediate aides could adequately function. But the NAC was never intended to be the permanent DHS headquarters. In 2004, the Coast Guard began a headquarters consolidation plan of their own and, shortly thereafter, DHS decided to broaden the Coast Guard project to include an overall DHS headquarters consolidation. DHS articulated a number of requirements for their headquarters, including 4.5 million gross square feet, with Level-5 Federal Facility Security, and within close proximity to key government buildings downtown such as the Capitol, White House, and other government offices. Reasonable people can disagree over the validity of those requirements, but the Bush administration determined that the only site to meet the stated requirements was the St. Elizabeths site along the Anacostia River in Southeast D.C.
After the new site was chosen, historical preservation concerns delayed work on the site for the first few years, and then the great recession occurred. Over the intervening years, both the Bush and Obama administrations sought congressional funding through the annual appropriations process in defined “usable segments.” With stimulus funding, GSA and DHS got just over $1 billion in 2009 to fund preservation, construction, and tenant improvements at St. Elizabeths. In such a tight budget environment, Congress decided to fund agents and officers on the front lines protecting the homeland rather than a DHS headquarters. From 2010 to 2013, very little funding for St. Elizabeths occurred. The Coast Guard was the first DHS entity to move into St. Elizabeths and completed their move in 2013. Current budgetary scoring rules discourage long-term capital investments like St. Elizabeths. Alternative sources of funding, such as land swaps and tapping private sector capital though public-private partnerships, are unfortunately discouraged by how the Office of Management and Budget (OMB) and the Congressional Budget Office (CBO) score these large capital investments. DHS has already requested additional money for other needs that would not be necessary if St. Elizabeths was further along schedule. For example, in the fiscal year 2015 budget request, DHS asked for infrastructure and technology improvements to the current National Operations Center (NOC), a critical information hub for managing incidents. DHS could not wait for St. Elizabeths; they needed improvements sooner. In accordance with the original plan for St. Elizabeths, DHS timed office leases to expire in conjunction with the plans for completed segments at St. Elizabeths. The delays in the project are forcing GSA and DHS to choose between costly short-term leases (that may get extended, costing more money) or locking in a longer term lease that can be re-evaluated in the future. At the urging of appropriators and the House Committee on Homeland Security, DHS changed the scope and some of the requirements for St. Elizabeths. When St. Elizabeths was originally proposed and approved, the project had a projected cost of $3.45 billion, with a completion date in 2016; however, in the department’s Revised Baseline Plan from June 2013, DHS and GSA submitted cost projections of $4.5 billion with a completion date of 2026. With the fiscal year 2016 budget release, DHS put forward the current Enhanced Plan with cost projections of $3.7 billion with a completion date of 2021. The current Enhanced Plan includes revised government space standards and flexible workplace strategies, such as hoteling and telework to accommodate more people in fewer seats. The current USCG Munro Building will be reconfigured for increased space utilization to account for revised government space standards and flexible workplace strategies. There will be no DHS consolidation on the East Campus, and FEMA is planned to move to the West Campus with sharply reduced square footage. The B section of the Department Operations Center will not be built. Hoteling space will be available for other components such as TSA, U.S. Citizenship and Immigration Services, and the Secret Service. A lack of consistent funding only increased costs and made the project much more difficult to manage. September 2014 findings from the Government Accountability Office (GAO) point to cost, schedule, and performance problems that have not kept up with the funding changes. DHS has agreed with the GAO’s recommendations, which are largely reflected in the Enhanced Plan. 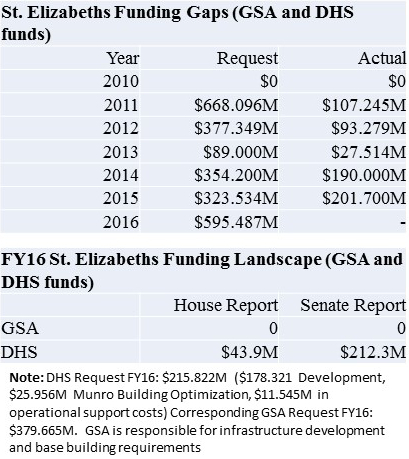 Even though the construction piece of St. Elizabeths is a GSA program, DHS is also applying DHS acquisition policies and has added St. Elizabeths to the DHS Major Acquisition Oversight List. Synchronize the construction schedule with expiring commercial leases to avoid costly short-term lease extensions. With the USCG and the full necessary infrastructure (power, water, and sewer) already at St. Elizabeths, it makes building a DHS headquarters somewhere else cost prohibitive. With already appropriated fiscal years 2014 and 2015 funding, the Center Building will be completed in 2017 to include the secretary’s office and the Department Operations Center. The Enhanced Plan’s biggest challenge is the large amount of funding per year needed to stay on schedule— $584 million in fiscal year 2016, likely $436 million in fiscal year 2017 and similar amounts to fiscal year 2019. These amounts are nearly impossible to fund in the current budget environment, but with leases expiring soon across several of DHS’s D.C. offices, the result will be more headlines like that of TSA where other DHS component agencies are forced to find space of their own outside of the St. Elizabeths campus. TSA not being a part of St. Elizabeths for the next two decades is the largest omission of the project. It further hurts that TSA is the most public facing part of DHS and, for some, the entire federal government. Perhaps TSA may be able to come to St. Elizabeths in greater numbers after the lease runs out. In the meantime, Congress should fully fund the St. Elizabeths Enhanced Plan in fiscal year 2016 and beyond. With each passing year of Congress not fully funding the St. Elizabeths project, the cost/benefits of consolidation decrease and the vision of an integrated DHS headquarters becomes more elusive. Note: At the time of this writing, Boston Properties has challenged the General Services Administration’s analysis of the bids that led to the Alexandria site selection. U.S. Court of Federal Claims Judge Charles Lettow on Nov. 12 halted GSA’s preparations to move TSA to Alexandria. Regardless of the outcome of the challenge, TSA is not likely to move to St. Elizabeths but rather a to-be-determined GSA leased property. Bradley Saull is a former DHS official and former aide to House Homeland Security Committee Chairman Michael McCaul. 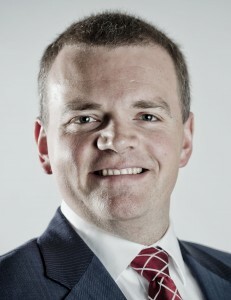 Saull is currently the Vice President for Civilian Agencies at the Professional Services Council. Negatives include no metro within a half mile, very restrictive parking, a less than desirable neighborhood, minimal amenities on site such as eateries, to name just a few. The only employees that want to go there live in DC. The consolidation makes a good story, but is just a placebo for the DHS issues.